The launch of Corporate Super Cup, 2016 received an overwhelming response, with 20 corporate teams participating - including Infosys, Convergys, Accenture, HDFC bank, Vodafone, among others. All the employees of the respective participating team and football lovers got to witness some top class football. HDFC Bank walked away with the trophy, winning the championship. CSC tournament 2016 not only gave an opportunity to the corporates to showcase their football talent but also helped to create larger fan base for Indian football. 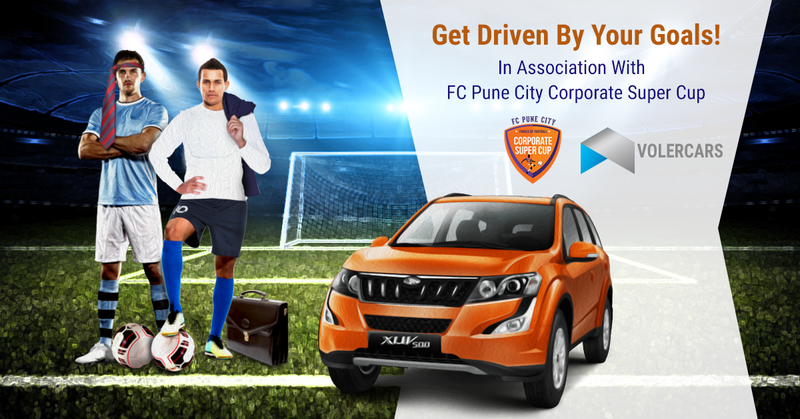 This year, FC Pune City is back with Corporates Super Cup, 2017 and Volercars is immensely excited to partner with the FC Pune City Corporate Super Cup. We hope "CSC Pune - Driven by Volercars" will be an exciting ride to success for the players. To all Punekar! Don't sleep your weekend away because it's time to get dirty on the field with your favorite team. Here are some more reasons to cheer for your favorite team. Do you miss football in India? Let's face it, when we talk about sports - we mean only cricket. So for all football lovers, it's an opportunity to experience top class football. Pune is a hub for IT & Manufacturing, with a large presence of reputed companies - Witnessing famous companies showcasing their football talent will be a unique experience for all the football lovers. Preach the game not the players - If you are a lover of top class football, it's time for you catch live FC Pune City, CSC 2017. Weekend is all about having fun - So why not take a break from our regular weekend routine and cheer for your favourite team in Corporate Super Cup, 2017. To all corporate partners and sponsors, Volercars is offering exciting discount, just use VOLERCSC17 as a coupon code to get flat 17% off on booking with us. So, what you are waiting for? Get driven by Volercars and cheer for your team. You are a true blue Puneker! Pune Corporates were awarded an opportunity to showcase their footballing talents on a professional platform and if you are a true blue Punekar, it's time for you to cheer for your favorite team right in your very own city.